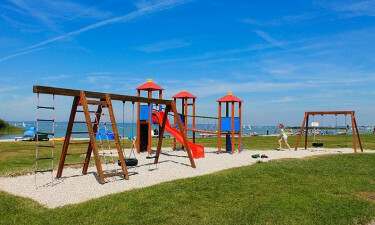 Set on the edge of the large and lovely Lake Neusiedl, Podersdorf is the perfect place for families to relax and have fun in the sun. Enjoying luxury camping is easy when you book your spot at Podersdorf through LuxCamp. Podersdorf is located in the Burgenland region of Austria, which is famous for its intense natural beauty. However, guests are sure to want to spend most of their time at the site, simply soaking up the enchanting site of Lake Neusiedl and taking part in various types of exciting activities. The site boasts a pool where children can spend time splashing around while their parents soak up the sun. The lake is also a popular place for guests to swim and sun loungers are provided for guests as well as a snack bar and a range of other amenities of guests to make use of. 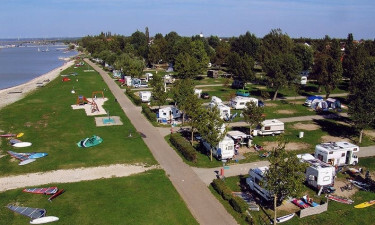 The large and lovely lake that is found at the edge of Podersdorf is lined by a stretch of golden sand for guests to enjoy during their camping holiday. The lake’s smooth surface offers excellent sailing experiences; sailing lessons are available on request.